Good: More than 200 rookies that should offer a market for prospectors and speculators, a fresh look for a classic brand, and the return of, “Dare to Tear" oversized cards with another card inside are just a few of the goodies Zenith delivers. You can expect on-card rookie and veteran autographs as well. Bad: There really isn't much not to like with Zenith. Aside from the obvious names missing from the checklist, the Panini crew loaded this up with an insane amount of rookies. They even managed to squeeze in an ode to the movie Grease, and they brought back a collector favorite with the Epix inserts. The Bottom Line: For just under $80 you can expect a combination of three memorabilia or autographed cards. Those signatures could include hard-signed autos of some of the greats of the game, including Steve Yzerman, Sidney Crosby, Alex Ovechkin, Ray Bourque, and Stan Mikita, just to name a few. This impressive autograph lineup is accompanied by 40 promising rookies. A lot of mixed things have been said about the recent designs coming out of the Panini offices. Some collectors love the similarities to the designs that they are familiar with, while others are craving a new look for many of their brands. 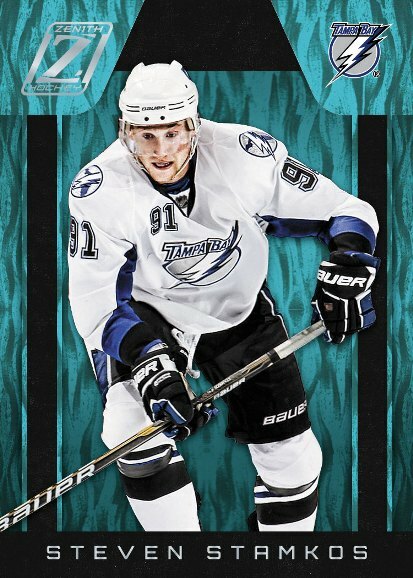 With Zenith, Panini has scored with a crisp design that lets the images take center ice. The base cards aren't too flashy, but are simple and elegant. Zenith is definitely a sign that they are moving in the right direction and if they continue down this path, the designs are only going to get better with time. The inserts will have fans of past Pinnacle and Zenith products ooohing and ahhhing over the return of Dufex in the form of Nufex. Even the parallels, labeled Red Hot and White Hot, utilize the popular printing technology. The 200 rookie cards included on the checklist gets instant props for Panini. This set is custom-made for those who simply cannot get enough rookie cards and want to build sets, once again proving the company IS listening to collectors. As with many Panini releases, they kept to their formula of delivering the best current players in the game, a select group of legends, and, if you've been following along, you know about the rookies. Of course, there are a select few key players missing and it is only because they are locked up in exclusive deals with other manufacturers, but Panini is working around them and putting out solid products regardless. Ten packs per box puts 50 cards in your hands. It doesn't seem like a lot, but it fuels the groundwork for building a set. That's where the value is going to be for Zenith. Yes, it will deliver big hits, but for the first time in a long time collectors can put together a hefty-sized collection. These packs will deliver value and they won't wind up in the dollar bins. Some boxes might actually deliver more than the specified odds. It has been verified that there are some extremely hot boxes of Zenith that deliver an entire case worth of hits. Zenith has it all. You get to reminisce about the past and enjoy it all over again with modern technology and a modern checklist. You get to build a hockey set that has incredible potential to grow for many years with 200 young guns hoping to become the next generation of all-stars. And then there is the box topper. The over-sized Dare to Tear jumbo cards create an element of fun that is unique to the product. You get to take a gamble on what's inside. It is the trading card equivalent of Let's Make A Deal without Monty Hall asking you what's behind door number one. The act of destroying a trading card is taboo among most collectors. Cards have value, but what if you were told that inside the card was another card and it was most assuredly more valuable than the outer shell? If you purchase Zenith, you'll get the opportunity to find out exactly what you would do in that scenario and it adds a whole new (Or is it renewed?) element to collecting. 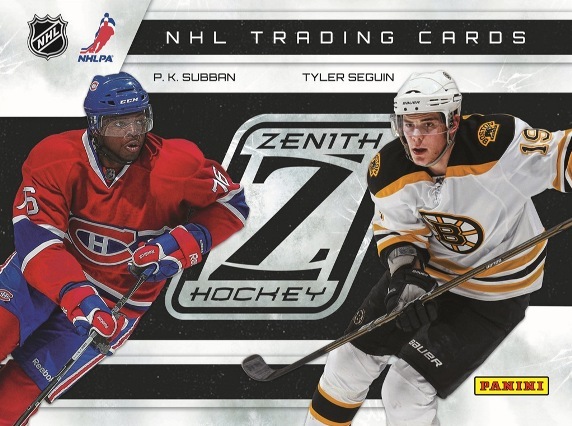 With 2010-11 Zenith Hockey, Panini will attempt to reinvent one of the more interesting brands from the era of sports card excess. In addition to receiving Zenith cards, each box will receive a jolt of life via the "Dare to Tear" box topper, which features Legendary rookie cards, Epix inserts as well as never before seen rookie cards from National Treasures and Elite. 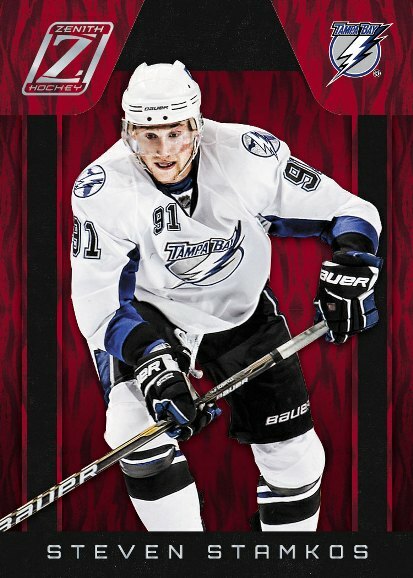 2010-11 Zenith Hockey is set to release on May 11th, with each box delivering 3 hits. Yours Truly 0n-card autographs from top-notch superstars such as Sidney Crosby, Alex Ovechkin and Steven Stamkos and autographed short-printed RCs numbered to just 199. Dare to Tear Box Toppers featuring Epix inserts and never before seen National Treasures and Donruss Elite Rookie Cards. Each case break delivers: 1 White Hot parallel, 5 autographed Rookie Cards, 4 Yours Truly autographs and at least 1 insert each from the Gifted Grinders,Scraps, Rookie Roll Call Materials, Epix Materials, Z-Team, Team Logo Die-Cuts insert sets. Checklist includes more than 200 rookie cards. 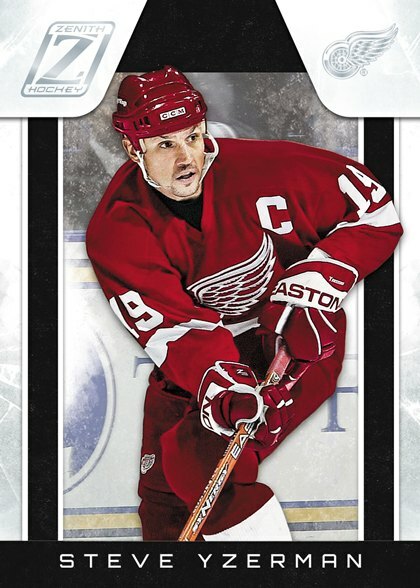 “The key to making this work is to force collectors to make a tough decision," says Al Muir, Panini America NHL Brand Manager. “Each Dare to Tear jumbo will feature either a true RC or one of hockey's greatest legends and it will be fairly limited. If you tear one, you're destroying a sure thing . . . but what you find inside might just make it worthwhile. 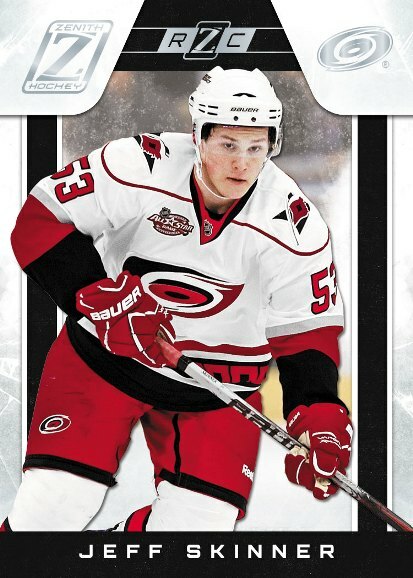 “Along with base cards and Epix inserts, we're seeding in RCs you won't find anywhere else, including National Treasures and Donruss Elite cards of Taylor Hall, Jeff Skinner and many more. We also have autographed versions of the unsigned RCs that are inserted in base packs, along with a number of other surprises." “A couple of reasons, actually. First, I was a big fan of Zenith back in the old days. 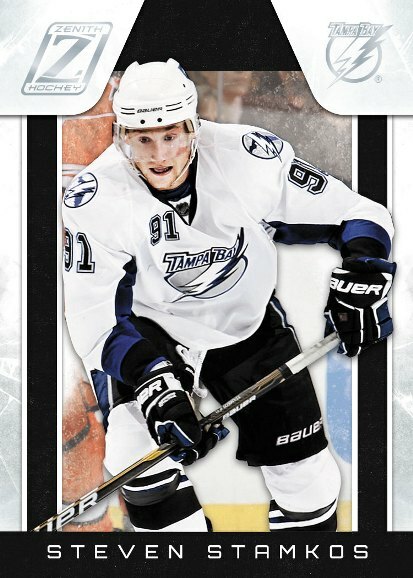 Like a lot of collectors, I have fond memories of the technologies, the hot RCs of Vinnie Lecavalier and Roberto Luongo and yeah, the Dare to Tear cards. It just seemed like a program that offered both a nostalgic tug as well as an opportunity to update it to make it compelling for modern hobbyists. “Obviously rookies have to be a compelling part of any modern program, but Zenith just developed into something else in a really organic way. We originally planned for 50 RCs, but there was a tremendous influx of first-year talent in December and January that forced us to reconsider the possibilities. We know collectors want to see these players and as quickly as possible, so Zenith provided the proverbial window of opportunity. As more rookies made their debuts, we reconfigured the product to add more and more of them. “Eventually, we ended up with three tiers of RCs, both signed and unsigned, within the base set. Then we added more RCs as part of the Dare to Tear program, both as jumbos and as some of the elements that collectors will pursue within the jumbos. We knew we weren't going to make National Treasures or Elite as full-on hockey programs this year, so we created mini-versions of these almost as extensions to our basketball or football programs of the same name. It's a unique approach that's really in keeping with the experimental nature of the original Zenith." “We'll definitely gauge how collectors respond to these in the secondary market. If the demand is there, we could certainly spin them off into their own entities as we move forward." 2010-11 Panini Zenith Hockey HOBBY Box National Treasure? Auto Patch Jersey? Wow! I love hockey, but don’t collect a lot of hockey cards. Growing up in the 70’s a huge Buffalo Sabres fan, I have to say, I love the “Tough Times” inserts, paying homage to the “goons” of the past…as a kid, my favorite player was Jerry “King Kong” Korab…I never expected to find a certified autograph of him….found one on Ebay, paid about $15, and then started collecting the rest of this subset…also love the “Behind the Bench” cards! Finally got a Lindy Ruff autograph card! Well long story short I got a hot box!!! 8 total hits other than inserts. Out of those 8 2 were rookie autographs and the other 6 were jersey cards. Of those 6 jersey cards 2 were the mosaic triple jerseys from 3 different players. I paid $45 for this box and it was well worth the value! !